To stay competitive, manufacturers have to meet the rapidly changing needs of customers while retaining high quality products, at the same time as controlling costs. Product lifetimes are shrinking and customers are expecting more customization and innovation. Agility is the key to staying ahead of the competition and meeting the needs of customers. The FabPro 1000 entry-level industrial 3D printer delivers production-grade parts, at high speed, with six sigma repeatability, and can be used across a distributed manufacturing and engineering enterprise. 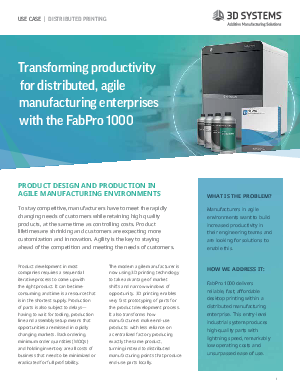 With a low cost of entry, FabPro 1000 enables agile manufacturing operations to meet customer needs rapidly and effectively empowers engineers to deliver more value and quality in the product development process.